This impressive Georgian mansion, surrounded by glorious parkland, was lovingly rescued from ruin by Lord and Lady Iliffe in the mid 1950s, when they restored the elegant interior and scoured the country salvaging 18th-century architectural fixtures and fittings. ** They filled their comfortable new home with fine paintings, fabrics and furniture, which can still be enjoyed by visitors today. ** There are waymarked trails through the historic parkland and gravel paths around the gardens. Why not visit our 'on location' exhibition and find out what goes on behind the scenes? 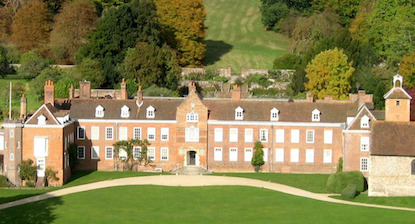 ** When first built it was the largest private house in the country with around 360 rooms, and in its heyday was frequently visited by the monarchs of the day including Henry VIII, Elizabeth I, and Philip II of Spain and Queen Mary I who honeymooned there in 1554 after their marriage in nearby Winchester. 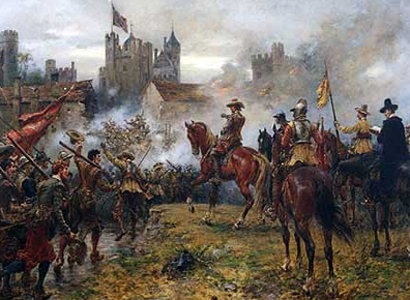 ** When the English Civil War broke out in 1642, England was divided between the Royalist, and often Catholic, supporters of King Charles I and those who favoured a more powerful Parliament, mainly Protestants. See more on the website below. Basing House is near Old Basing village, 1 mile east of Basingstoke. Space, fresh air, tranquility, fun, adventure, enchanting animals, exotic beauty and all this on the banks of the magical Thames. Lower Basildon, Nr Pangbourne. Opening Times 10am until 6pm, last admissions 5pm. 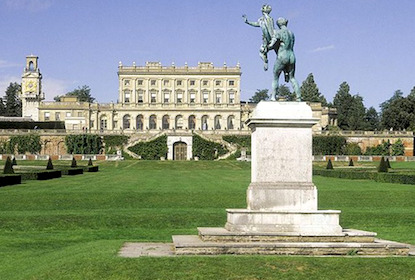 Set high above the Thames with far-reaching views, Cliveden�s impressive gardens and majestic woodlands capture the grandeur of a bygone age. ** Follow in the footsteps of dukes, earls and royalty as you explore a series of gardens, each with their own special charm. From the formality of the Parterre with its vibrant floral displays to the quirky statuary and topiary in the Long Garden, the gardens will delight you in every season. ** For younger visitors, the Storybook Play Den encourages imaginations to run wild as you play amongst wooden carvings of favourite storybook characters whilst the 500 metres of winding paths in the Cliveden Maze make it a challenge for all ages to find the centre. 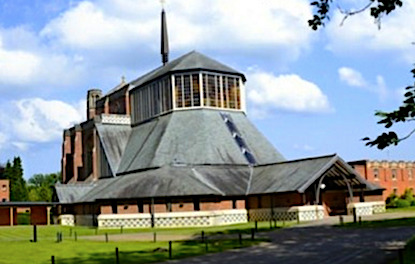 Douai Abbey is home to a community of monks of the English Benedictine Congregation. The monastery is under the patronage of St Edmund, King and Martyr, and was founded in Paris in 1615. 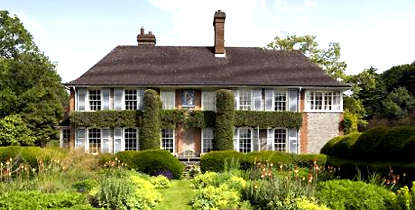 Uprooted by the French Revolution it settled at Douai in Flanders, and finally returned to England in 1903, settling at Woolhampton in Berkshire. ** Until 1999 the community ran a school. Douai monks still maintain the other principal English Benedictine apostolate, serving the Church in parishes throughout England. At the monastery itself we welcome guests on retreats or courses, as well as those who seek merely some quiet time. There are facilities for conferences of modest size, and youth or chaplaincy groups. Our library and archive building houses a rich resource for study and research, and is open to researchers and students by application. From time to time we host a number of sacred concerts given by leading performers. ** However, the primary work of the monks is the regular celebration of the sung Divine Office and the Mass, and all such liturgical worship is open to the public. If you are a single Catholic man between the ages, generally, of 18 and 45 and wonder if you might be called to share our way of life, please do look at our information on vocations. The story of Englefield goes back to 871AD when a battle was fought on the hill above the village, marking an important victory by King Alfred over the Danes. The battlefield was named by the Saxons as �Anglefield� or �Field of Angles� which became Englefield over time. ** The House is currently lived in by Richard and Zoe Benyon and their family, and the Estate is a thriving community consisting of farms, woodlands and residential and commercial properties. ** While the family are modern in their approach to the day to day management of the Estate they are respectful of the history that comes with it and mindful of its responsibility. Forbury Gardens is a delightful Victorian town garden, created at the height of the urban parks movement - they have recently undergone major restoration. **They are located between the town centre and the ruins of the 11th century abbey, not far from Reading Station. The ornamental gardens have a wall around which provides a peaceful and tranquil retreat. 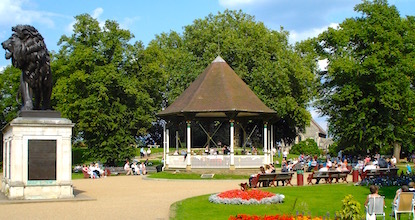 There is a bandstand, and bands play every weekend in the summer. The Forbury Gardens is home to the famous Maiwand Lion statue. **Although there are no formal children's facilities, the gardens are wonderful for play, and the kiosk serves coffee, ice-creams and light lunches. The gardens have been entered for three national competitions, and have so far won a Green Flag Award every year since re-opening, along with annual accreditation as a Green Heritage Site, the BALI award and Best Regional Park in the Britain in Bloom competition. A family home, delightful gardens and an idyllic setting - a peaceful estate set in the rolling hills of the Chilterns. 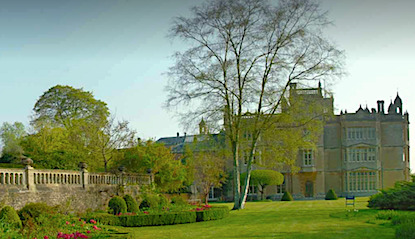 ** This picturesque 16th-century mansion and tranquil gardens were home to the Brunner family until recent years. ** The house exudes a welcoming atmosphere with a well-stocked kitchen and homely living rooms. The series of walled gardens is a colourful patchwork of interest set amid medieval ruins. ** Other buildings from earlier eras include the Great Tower from the 12th century and a rare Tudor donkey wheel, in use until the early 20th century. Highclere Castle is a beautiful building and a warm, welcoming home to visitors and guests at events and celebrations held here. ** Apart from exploring the Castle, the Egyptian Exhibition fascinates adults and children, whilst the surrounding Grounds and Gardens provide peace and tranquillity. The photographs, videos and information on our website might inspire you to read the books about the real people here, their lives, loves and challenges they faced. ** When you visit, you will recognise many rooms from the Downton Abbey TV series. You will see the Drawing Room in which Maggie Smith delivered many a withering comment to some unfortunate relation. In addition you can also find Tutankhamun in the cellars. ** We are open for between 60 and 70 days a year to public visitors, but create many special tours, charity events as well as holding events such as concerts and country fairs in the park. ** Please note that the gardens and woods can be explored only when Highclere Castle is open to the general public. 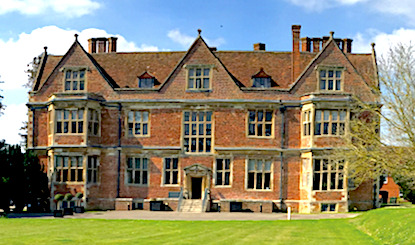 Away from the distractions of town, business or busy hotels, Mapledurham is an oasis of peace, natural beauty and history which can be an ideal venue for fun corporate events, dreamy weddings or just a good day out. ** The location has attracted many film and television productions and continues to be enjoyed by visitors and holiday- makers alike. ** Experience the Mapledurham Estate and the surrounding countryside through our public and private events. 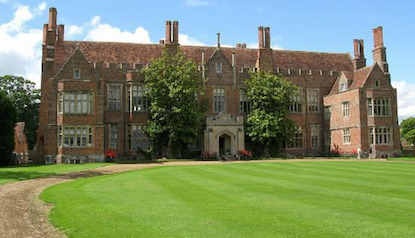 ** Visit the Mapledurham House and Watermill, both of which date back to Doomsday England and have a varied history. ** From the comfortable sitting room with a small black and white TV, to Lord Nuffield's humble bedroom with a secret built-in workshop, this intimate home exudes the tastes and interests of its remarkable owner. Off the A4130 between Henley and Wallingford, down Bradley Road. Shaw House is one of the best-preserved Elizabethan mansions in England. over the centuries the House has welcomed royalty, seen action during the Civil War, housed soldiers during World War II and schooled generations of local children. 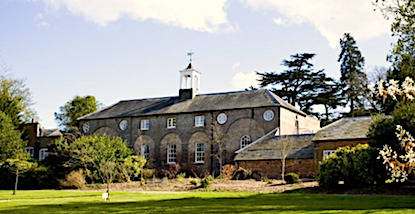 ** Shaw House is the perfect venue for conferences, meetings and training and is ideally situated in tranquil surroundings on the north side of Newbury, within an hour�s journey of London, Bristol, Oxford and the South Coast, and just five minutes from the M4/A34 junction. It�s a 25-minute walk from Newbury town centre and is accessible by public transport. Stonor Park is open to the public Sunday afternoons from 6 April to 28 September 2014, bank holiday Monday afternoons between these dates and Wednesday afternoons in July and August. ** Stonor Park is the home of Lord and Lady Camoys and has been owned by the same family for over 850 years. Come and see a family home set in the beautiful Chiltern Hills with commanding views of the surrounding deer park from the terraced hillside gardens. ** A house of considerable architectural interest built from c.1190 and constructed over centuries, containing a remarkable collection of Old Master Paintings, European sculptures, painted glass and contemporary ceramics. ** The medieval Catholic Chapel, used throughout the years of Catholic repression, continues in use to this day. ** Enjoy a traditional cream tea and find unique gifts in our shop. An intimate family home, the history of the Vyne spans the centuries. From its royal beginnings in Tudor times to its place today as a intriguing retreat for you to explore, you can lose yourself in the surroundings that inspired great authors such as Jane Austen. ** Discover a chapel where sunlight streams in through stained-glass windows, a ring that may have inspired Tolkien or an oak gallery fit for a king. ** You could enjoy the view from the house in winter of the first hoarfrost or the autumnal glow of the woodland on a misty morning. Can you see yourself spending lazy summer days picnicking on a lawn that stretches to a shimmering lake? ** The gardens are a peaceful escape with secret picnic spots, or you can stroll by the ornamental lake. Why not take in the restored Walled Garden, now a working kitchen garden providing delicious, fresh and seasonal produce to our Tudor tea-room. In the beating heart of the South East, Wasing Estate has matured gracefully over 250 years under the ownership of the same family since 1759. ** Offering paths and tracks throughout the magnificent woodland and parkland for walking and riding, Wasing Estate has magnificent lakes and meandering rivers for fishing. ** Discreetly located near Reading, Wasing Estate is close to the M4, M3 and national rail network, all providing easy access to major towns and cities including London, Newbury and Basingstoke. A traditional farming and sporting Estate, Wasing has diversified to provide one of the UK�s finest coarse fisheries, whilst maintaining responsibility for the environment and wildlife conservation. ** In recent years, our latest venture has been to create the �venue of venues� with Wasing Park offering a stunning setting for your wedding or event in an idyllic location within the Berkshire countryside. Nestled between the Berkshire villages of Aldermaston, Brimpton and Woolhampton. Wellington Country Park is situated in 350 acres of beautiful parklands and is located just off the A33 between Reading and Basingstoke, on the Hampshire/Berkshire border. ** It offers a safe, open air, fun filled venue for all the family, with facilities and attractions especially suited for children up to the age of 10. ** To enjoy, we have several adventure play areas, a toddler�s area, sand pits, slides, miniature railway (�1.50 extra), animal farm and petting barn (seasonal), nature trail maze, enchanted forest, water play, 9 holes of crazy golf and loads more play equipment to climb on and in; all will ensure a fun filled day. ** Within woodlands, there are four nature trails to follow, taking in sights of our vast array of wildlife in their natural habitat. One trail allows you to get up close and personal to our resident herds of Red and Fallow deer. Bucklebury Farm Park offers a magical experience and a great value day out in the countryside whatever the weather, that will appeal to the whole family, friends, schools and clubs. ** 60 acres of park and farm land, including free tractor rides to see the red deer herd. ** Latest research shows that just five minutes of exercise in a �green space� such as a farm park can boost physical and mental health. * Interacting with animals is also proven to help us emotionally, lifting the spirits and giving an insight into the natural world. ** At Bucklebury Farm Park you can run, jump, swing, go-cart, de-stress and be out in the fresh air all year round and we are a great venue for Birthday Parties, educational School Visits, corporate days, special events and celebrations. Dinton Pastures Country Park has just over 335 acres. The Park is open daily throughout the year. ** It offers a variety of habitats including 7 lakes, 2 rivers, and meadows. Three public bird hides provide secret viewing of the waterfowl, with one specially adapted for wheelchair users.